This week’s court ruling on the bedroom tax and BBC Trust verdict on the John Humphrys welfare reform documentary got me thinking again about the importance of language in the debate on both. Language matters. You don’t have to be familiar with discourse analysis to know that there is a difference between ‘the bedroom tax’ and ‘the spare room subsidy’ or ‘welfare’ and ‘social security’. The words we use to frame ideas have a power that goes beyond themselves because of the associations, conscious or otherwise, that they bring with them. The battle of language is also a battle of ideas and of ideology. I’m acutely conscious that every time I write ‘bedroom tax’ I am using a term invented by its opponents. As a blogger I know that I do not have to be bound by considerations of journalistic impartiality, but I still feel periodically uncomfortable with this. I justify it to myself on the grounds that it is common currency among people who work in housing and that it was first coined not by a politician but by the admirably independent peer Lord Best. I could say ‘social sector size criteria’ or ‘under-occupation penalty’ but I think my meaning would be less clear if I did. I could even say ‘spare room subsidy’ but more on that below. I’m even more aware of the power of language when I write about ‘welfare’ and ‘welfare reform’. This is commonly used – and commonly understood – terminology that has been used by politicians of all parties and again I justify it to myself on the grounds that my meaning might be less clear if I used an alternative. However, ‘welfare’ comes loaded with ideological baggage. Even at the very beginning William Beveridge railed against the ‘welfare state’ that he had supposedly created because of its ‘Santa Claus’ connotations. He preferred ‘social service state’. Since the 2010 election the Conservatives have claimed ‘welfare’ as their own, and one of their key strategies for the next election is to brand Labour as ‘the welfare party’. Labour continues to squirm as the government makes new cuts in benefits in the knowledge that opposition will put it on the wrong side of the opinion polls. Arguably much too late, the Labour leadership has taken to talking about ‘social security’ instead. The politics of ‘welfare’ was imported from the United States, where ‘social security’ means pensions and ‘welfare’ refers to working age benefits, especially those paid to single mothers. Writers like Charles Murray argued this was creating a ‘culture of dependency’ that was transmitted to their children and creating an ‘underclass’ of welfare recipients. ‘Welfare reform’ is also an American import. As advocated by people like Lawrence Mead, who was interviewed extensively in the Humphrys documentary, it was implemented by the Clinton administration in the 1990s and became known as ‘workfare’. The John Humphrys documentary set out to examine this change in the politics of ‘welfare’ and the shift in public perceptions that accompanied it ahead of the Welfare Reform Act. My impression at the time was that it gave far too much prominence to advocates of the ‘dependency culture’ thesis like the Centre for Social Justice in the UK but that it was more balanced when it presented the results of welfare reform in the US. You can make up your own mind by watching again here. that Humphrys conflated his personal opinion with factual reporting, breaching editorial guidelines that prohibit BBC journalists from expressing personal views about public policy. That’s not quite what Duncan Smith was saying two weeks ago when interviewed by Humphrys on Today programme the benefit cap and (ironically) his misuse of statistics. However, it does bring me neatly back to where I started with the bedroom tax/spare room subsidy. There is of course nothing wrong with an elected politician or a campaigner describing a policy in whatever language they like. However, where a supposedly impartial media goes along with it there is a problem. That was exactly the point made by IDS himself when he complained to the BBC in March that it was ‘using the language of the Labour Party’ by referring to the ‘bedroom tax’ in news reports. On March 6 David Cameron used it for the first time at prime minister’s questions in a bid to change the terms of the debate. The Conservative leadership had clearly decided – much too late – that language matters and that ‘under-occupation penalty’ and ‘social sector size criteria’ were not doing the job. For me, this was much too late since ‘bedroom tax’ had already stuck but ministers continue to insist on ‘spare room subsidy’. Compare that with the final impact assessment of ‘social sector under-occupation’ from June 2012, which does not mention ‘spare room subsidy’ (or ‘bedroom tax’). Press releases issued as the Welfare Reform Bill also used the neutral term ‘social sector size criteria’ until the run-up to implementation on 1 April. 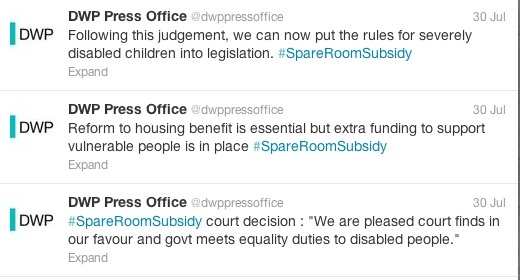 Even in late January, DWP tweets were referring to the ‘so-called bedroom tax’. 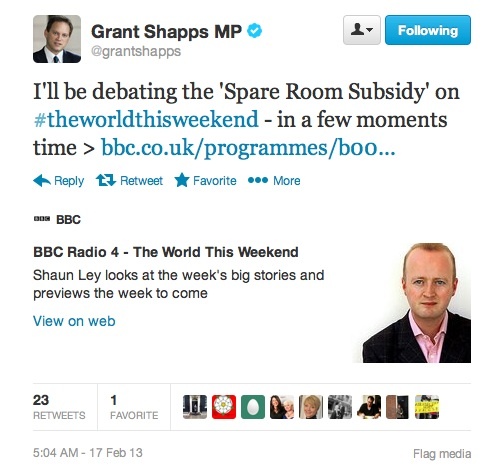 However, from the end of February onwards, DWP communications have routinely used ‘spare room subsidy’ instead. This statement on Tuesday’s court case is a classic example but the same politicised language is also used in other website content including this ‘fact sheet’. Among the various codes on civil service behaviour, the one that I can find that covers the behaviour of press officers in most detail is the Propriety Guidance produced by the Cabinet Office. In ‘press office dos and don’ts’, press officers are told they that should ‘present, describe and justify the thinking behind the policies of the minister’ and ‘be ready to promote the policies of the department and the government as a whole’. However, they should not ‘justify or defend policies in party political terms’. There are also four ‘government publicity conventions’. The second and third stipulate that government communications should be ‘objective and explanatory, not biased or polemical’ and ‘should not be – or liable to be – misrepresented as being party political’. We live in a politicised world. The way that power operates makes complete impartiality impossible in the civil service as in the media. However, conventions like this and the BBC’s rules on impartiality exist for a reason. Language matters – whoever you are. YES – language really does matter… it is also important that the general public understand that the caps on HB in line with LHA have impacted on those renting in the private sector to restrict their benefit assistance if they are occupying a home with rooms surplus to their household size, for many years – one reasonable but under reported intention – of these welfare reforms is to bring some parity between the assistance provided in both sectors… social tenants already have many benefits over those in the private sector – security of tenure and lower rents compared to those commanded by private landlords – seems fair enough that benefit assistance to both sectors is assessed according to comparable rules!? Too much ‘weight of coverage’ has been given to this being a penalty for social tenants who under-occupy – (and who can give succession to their off spring – not something that private tenants can exercise) – which has diverted attention away from the plight of the thousands of households who have 2 months notice between them and homelessness, renting in the private sector and struggling to make ends meet. These are not ‘low lifers’, ‘benefit scroungers’ or ‘lazy n’er do wells’ (as often portrayed in the press) The country needs to understand that many hard working lower income families get some HB assistance to help them afford the often extortionate private rents – and these folk have seen their HB reduced if they have rooms surplus to their family size for many years already…. The media have got much to answer for in my opinion….ditto the appalling back lash on the ‘Help to Buy’ initiative… we have had HomeBuy products for over a decade which have not fueled a hike in property prices and there has been no organised demonetisation of these government funded products, so why now all the negative hype about this equity loan scheme? It is not a hand out – it is a helping hand and it works…. reporting about this product and ill informed reactions to it ,further serves to demonise anyone in receipt of any kind of assistance! This will again fuel stereotypical prejudices and divide communities – when there are many housing professionals out here working very hard to try to create integrated balanced mixed and sustainable communities – thanks Media… you shoot us all in foot again. Carmel, you are saying the same rules should apply to social housing tenants as to private tenants, i.e. that both should be penalized equally for having too comfortable and spacious housing. Are you really advocating a ‘race to the bottom’ in public subsidy for tenants on low incomes? You don’t seem to be making a plea for a little bit of discretion and humanity when it comes to public assistance with housing costs, but rather that all who can’t afford the full cost of their own housing should be similarly incommoded. You seem to be broadly in favour of the Bedroom Tax. Is that the case?